Henry Gordon Gale (September 12, 1874 – November 16, 1942) was an American astrophysicist and author. Gale was born in Aurora, Illinois. During World War I he served in the United States and France, obtaining the rank of lieutenant colonel and receiving the Legion of Honor. He was married to children's author Agnes Gale, with whom he had a daughter, Beatrice. Gale was educated at the University of Chicago where he received his PhD in physics in 1899. He was a member of the Delta Kappa Epsilon fraternity. He served on the faculty of the University until his retirement in 1940, by which time he was chairman of the physics department. His work in astrophysics was divided between the University of Chicago and the Mount Wilson Observatory in Pasadena, California. In 1909, he was badly burned while working at the Observatory and hospitalized for two months. 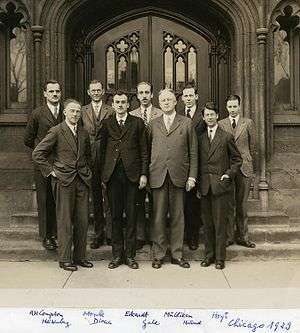 Gale was editor of the Astrophysical Journal from 1912 to 1940, and authored several books and papers, including First Course in Physics (with Robert Millikan), a textbook that was used as a standard in many schools.